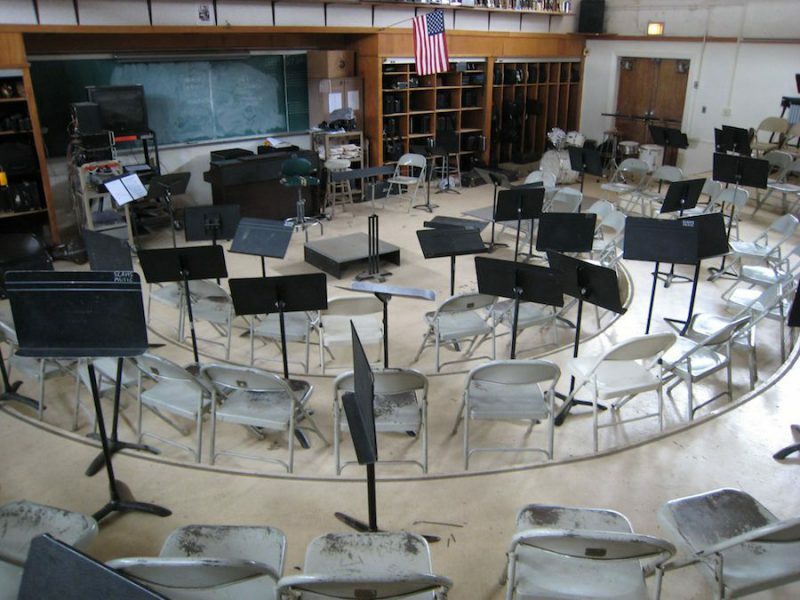 Every year, public school band programs enroll thousands of students. These students learn valuable musical skills that don’t often make it to the guitar world. It’s unfortunate that we completely ignore the world of large ensemble playing because there is so much to learn! You may not of noticed this, but to play guitar you don’t have to breathe. Well, except to live and all that jazz. But breathing as a section and before entrances in the band room is a big deal. It helps make sure everyone is synced up and ready, and it helps ensure everyone comes in together. Breathing while playing guitar is important to. It helps give you that perfect amount of space between phrases, and it can help navigate difficult rhythms. In short, performing demands some sort of choreography. You don’t have to plan out every breath, but it helps to think about the big ones (beginning of the piece, ends of phrases/sections, etc). In band, not everyone is in the spotlight all the time. You section might have to play a subservient role and just sit in the background now and again. The classical guitar, like Segovia said, is like a small orchestra (or wind band). It’s your job as the performer to figure out what is important within the texture of a piece and bring it out. Hint: the melody is probably a big deal, and the rest of the texture should sit comfortably behind and support it. It’s a fact of band-room life that sometimes other people won’t work hard enough. They won’t learn their parts. Then those sections have to be worked on during rehearsal time. The flip side of the coin, of course, is that the director wants something different and works with a individual instrument section, not to correct mistakes, but to shape their playing in the way she desires. If the guitar is a small orchestra, you better make sure every part is up to snuff. When’s the last time you worked on a bass line by itself, shaping it into exactly what you wanted? I’d bet it’s been a while. So instead of just running the entire texture at once, take out parts and get them perfect before putting the entire piece back together. If you’ve ever been to an orchestra or band concert, you’ve probably reveled in the massive amount of color and timbre on tap. But here’s the thing: color usage (changing the instrumentation) is not random. It helps define the form and development of a piece; color is one of the tools with which the composer works to create a sense of progression and scope. And it’s too bad that guitarists don’t consider color usage in the same terms. Remember that you can use color to build to a high point, or help differentiate phrases. Color use should never be random. Before every band concert, a good conductor goes over all the logistics of the event. Then the dress rehearsal will often include walking in and out, sitting down, bowing, and all the stuff. This all falls under the category of stage deportment — how you conduct yourself on stage. True story: people go to a concert to see as much as they do to hear. So practice these little logistical things. They matter, and, as a bonus, practicing them may help you feel more in control of the situation. I played trombone in band for 8 years as a kid. I learned invaluable lessons that I still use today as a pianist. I especially identify with #2 – learning how to play in an ensemble is something that is overlooked by many young pianists. Much of my work these days is accompanying work and other ensemble-type jobs, and understanding blend, space and balance is vital.